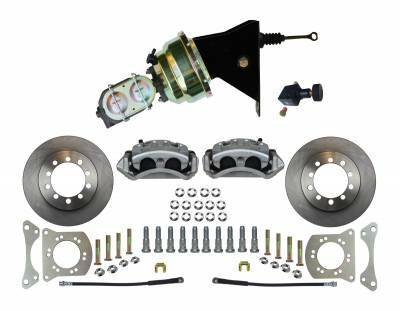 Click on a product image below to view more info on early Ford Bronco disc brake conversion kit components. Add the safety, reliability and performance of disc brakes to your 66-75 Ford Bronco with our drum to disc brake conversion. 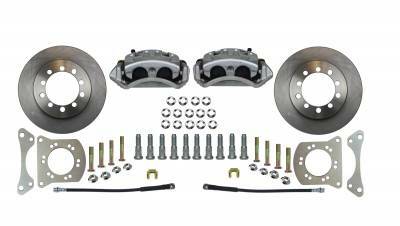 In this kit you receive everything you need to mount dual piston disc brakes to the factory drum brake knuckles of your vehicle. No cutting, drilling or grinding necessary, this is a true bolt-on kit. All components used in these kits are new high quality, precision machined products. This kit is designed to work with your stock or aftermarket locking hubs and bearings. Add the safety, reliability and performance of manual disc brakes to your 66-75 Ford Bronco with our drum to disc brake conversion. In this kit you receive everything you need to mount dual piston disc brakes to the factory drum brake knuckles of your vehicle. No cutting, drilling or grinding necessary, this is a true bolt-on kit. All components used in these kits are new high quality, precision machined products.This kit is designed to work with your stock or aftermarket locking hubs and bearings. Add the safety, reliability and performance of power disc brakes to your 66-75 Ford Bronco with our drum to disc brake conversion. 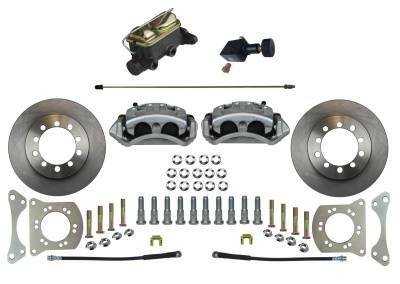 In this kit you receive everything you need to mount dual piston disc brakes to the factory drum brake knuckles of your vehicle. No cutting, drilling or grinding necessary, this is a true bolt-on kit. All components used in these kits are new high quality, precision machined products.This kit is designed to work with your stock or aftermarket locking hubs and bearings. 51mm Zinc Plated Dual Piston Calipers. LEED Brakes is excited to announce the release of our Front Disc Brake Conversion Kits for Bronco Dana 30 & Dana 44 Axles. The conversion kits are designed to bolt directly to front knuckle with no modifications. Each kit is made to be a direct fit to your vehicles axle. Each kits includes precision machined caliper mounting brackets and spacers with a rust resistant zinc plating. All calipers are assembled with two 51mm pistons. The caliper also receives a zinc plated finish for rust protection. Every caliper is individually tested after assembly to ensure you receive a top quality caliper ready to work out of the box. All kits include all the necessary mounting hardware and complete instructions to make for an easy installation. Will my stock master cylinder work with this early Ford Bronco disc brake conversion kit? In most instances your stock master cylinder will work with this kit. Bronco's are one of the most heavily modified vehicles on the road today. Changing your wheel size, axles, adding more weight, ect.. can really affect your braking performance and pedal feel. Our tech team can provide you with a list of master cylinders that will work on your Bronco if you need to improve your pedal feel.